Perfect Turn-Key Opportunity With Successful Automotive Franchise Brand. If you’ve been looking for a lucrative investment opportunity, Grease Monkey® has incredible existing franchise locations available. We offer both single center and multi-unit opportunities, available at very attractive pricing. What makes these business opportunities so extraordinary? • A distinctive, forward-thinking brand. We are innovators. We never settle. We occupy a reputable and unique space in the automotive industry. • No automotive industry experience required. That’s because we offer comprehensive training. All new franchisees go through our broad-based, instructor-led startup-training program. We also offer a full catalog of training courses through our online university, along with on-site training as part of our ongoing support. • Existing customer base. Build on the foundation already in place, and grow the business to its fullest potential. • Experienced team in place. These businesses come with the option of a fully trained manager and crew, so you can focus on building the business rather than hiring and training an entire crew. • A complete, fully documented, and proven System of Operation. This is an ideal opportunity to buy into a National brand with a proven formula for success. • An ongoing, experienced support team. We’ll be with you every step of the way to help ensure your success in key areas of your business. Let’s face it… starting from the ground-up can be daunting! This is a turn-key, up-and-running business, ready for the right entrepreneur to step in and take to new heights of success. Get all the benefits of being a part of a National brand and franchise community, without having to start from scratch. All this, with pricing beginning at only $100,000! CALL NOW FOR DETAILS: Lori Schneider, Franchise Development Specialist – (720) 454-4412, or email loris@greasemonkeyintl.com. You may also complete and submit the form below. Founded in 1978 and part the FullSpeed Automotive™ family of brands, Grease Monkey® is one of the largest automotive quick lube franchisors – not owned by a major oil company – with more than 320 centers currently located in the United States, Mexico, South America, China, and Saudi Arabia. 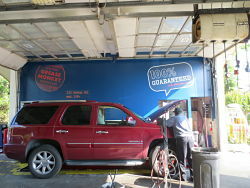 Grease Monkey centers focus on providing a “less hassle, more hustle” customer experience to fit the busy lives of the driving public by meeting their vehicle maintenance needs. Over the course of 40 years, the Grease Monkey® brand has grown to become one of the nation's most reputable automotive preventive maintenance franchise concepts offering its signature full service oil change and a wide range of additional services. For more information, go to www.greasemonkeyintl.com. To find out more about Grease Monkey® centers for sale, please fill out the form below and submit.